Today, I am over at the Craft Storage Ideas (CSI) website, with some Daring DIY scrapbook rooms. Have you ever thought about painting your room a bright, bold color? Head on over to the CSI site to see some daring scrapbookers who did just that! Today I am over at the Craft Storage Ideas website with a blog post craft room tour. If you love vintage, then make sure to pop on over and read the post, peruse the pictures, and then follow the links for more eye candy and inspiration! I love the bright, colorful, vintage feel of the featured craft room. You can check it out here. Today I am posting over at the Craft Storage Ideas website. The topic is Daring DIY, and I chose to write about caravans/trailers that have been converted into craft rooms. It doesn’t get much more daring than that! There are some stunning pictures of what these crafty ladies have done with their mobile craft centers. Make sure to pop over to the CSI site and then follow the links for more pictures and information about each of the unique spaces. I love to use embossing powders. 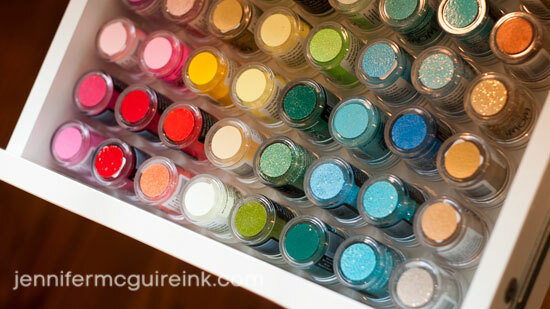 Now, I’ll admit that I have only a small collection of colors to choose from, but I would love to add to my stash. The other day, I helped my daughter create a cover for her science project. We started with black cardstock and then embossed the word “Galaxy” with a beautiful kaleidoscope powder that shimmered and sparkled, just like the stars in the night sky. This got me thinking… 1) embossing was fun, 2) I have all of the supplies that I need to get started, and 3) embossing creates a dramatic effect on any project! I definitely don’t use my embossing supplies like I used to, but creating that project the other day gave me the embossing bug and I am ready to dive back in! 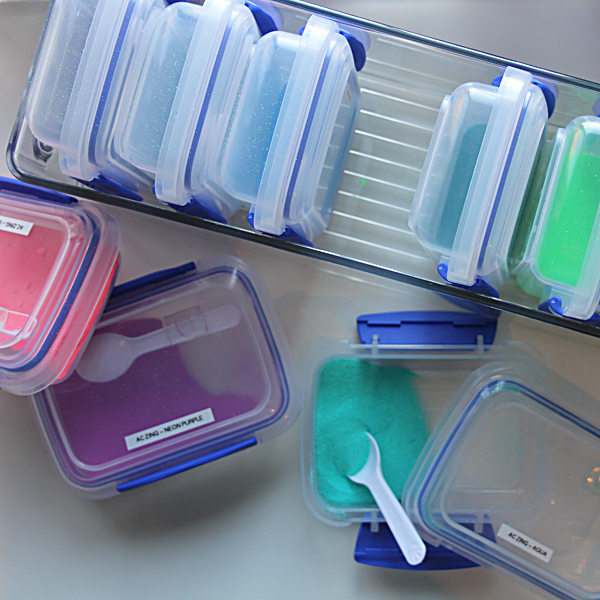 This brings me to today’s post on embossing powder storage. If I am going to begin collecting additional colors, I am going to need a system for storing them. 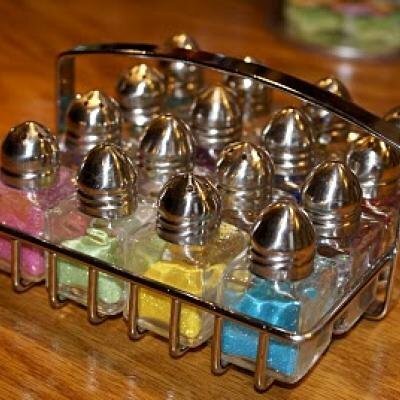 If you are looking for some creative ideas on how to store your powders, then this is for you, too! 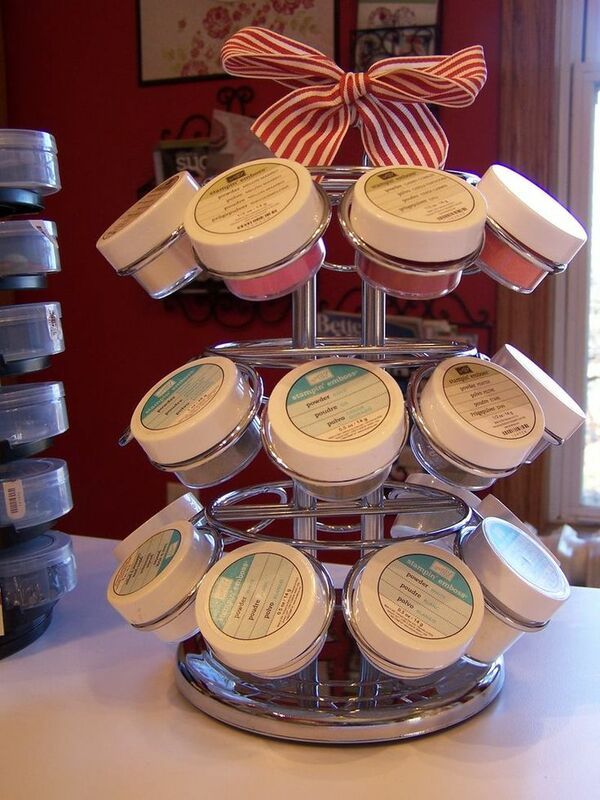 Do you have a creative way to store your embossing powders? Let us know in the comments! Today I am over at the Craft Storage Ideas website, with a post about DIY craft desks. You can check those desks out here. There are some great ideas for quick, functional desk space for your craft room or office! Today I am posting over at the Craft Storage Ideas website. 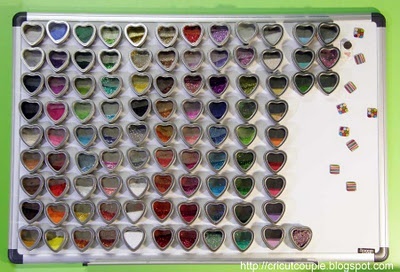 Go and check out how crafty people are storing their supply of beads, both large and small. There is also a link to a great tutorial on re-purposing an old vintage trunk into craft storage. Today, I am sharing a little Washi tape love! I was searching online for some Washi Tape storage ideas and came across this post that lists 27 amazing solutions all in one place! If you are looking for creative ways to store your ever-growing collection of Washi tape, then check it out for some inspiration.